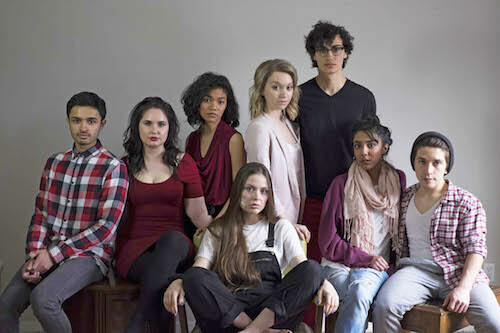 On July 5th 2017, a cast and crew of young artists will open Perfect Couples, a new Canadian play that explores the lives of four couples, mainly focusing on one lesbian couple, as they navigate their lives in Toronto while coping with various mental illnesses. This riveting, relevant, and witty piece is by Ryerson Theatre School graduate Mitchell Janiak and it will be produced by Pencil Kit Productions. It will play at the Helen Gardner Playhouse from July 5th- – 15th, and the the Hamilton Fringe from July 18th – 30th. “The script was exciting for me because of its emphasis on queer female narratives,” says Claren Grosz, the director and Artistic Director of Pencil Kit Productions, “It was also refreshing that it’s a play centred on millennial experiences without reducing them to only twitter references and cellphones”. Founded by Grosz in 2016, Pencil Kit Productions has sought to give young and upcoming artists the chance to create new and original work, as well as to present fresh takes on classic work. Their debut show Persephone, a feminist take on the classic Greek myth, premiered at the Toronto Fringe last year with rave reviews from Now Magazine and Mooney on Theatre. Mitchell Janiak and Claren Grosz met as classmates in Ryerson’s acting program. They bonded over their frustration of the lack of authentic younger characters in theatre. When Janiak began writing the script 3 years ago, Grosz knew the piece would be relevant to younger audiences. “Over half the audition submissions we received included a personal statement of how mental illness have affected the applicant’s life.” Grosz adds, “As classmates who have been though and witnessed the dark times of attending University in the big lonely city while growing into adulthood, this felt like an important project for us to work on together”.